The study had a total of 600 participants, which included 300 each from urban and rural areas. The mean [±standard deviation (SD)] age of the study subjects was 39.8 (±13.5) years and 41.5 (±14.9) years for urban and rural areas, respectively, and this difference was found to be statistically insignificant (t = −1.460; p = 0.145). The age distribution of the population was typical of a developing country with a large proportion of young people compared to the older people [Figure 1]. With regard to gender, 58.8% (n = 353) of the study participants were females [59.7% (n = 179) in the urban area and 58% (n = 174) in the rural area] and 41.2% (n = 247) were males [40.3% (n = 121) in the urban area and 42% (n = 126) in the rural area]. 15.0% (n = 90) of the participants were illiterate, 24.0% (n = 144) had received education up to primary school level, and only 6.5% (n = 39) had completed their graduation. Overall, most of the workforce was employed in the agricultural sector followed by people in elementary occupations such as street vendors, home-maids, and auto-drivers. Using modified B.G. Prasad's socioeconomic scale, the present study found that 58% (n = 348) of the participants belonged to the middle class [26.5% (n = 159) from the upper middle class and 31.5% (n = 189) from the lower middle class]. Regarding marital status of the study population, it was found that 482 out of 600 (80.3%) were currently married. Three-generation families were the most common (38.3%) followed by nuclear families (35.7%) and joint families (26%). The prevalence of hypertension at 95% confidence interval with continuity correction in the present study was 21.0% (17.9-24.5%). A large proportion of the study participants (272 out of the 600; 45.3%) had prehypertension [Table 1]. The prevalence of hypertension was 23.7% and 18.3% in urban and rural areas, respectively, but this difference was found to be statistically insignificant (χ2 = 2.572; p = 0.109). Out of the total 126 hypertensives, 46 (36.5%) were known cases and the remaining 80 (63.5%) were newly diagnosed cases. The prevalence of hypertension increased with advancing age; it was 6.0% in the age group of 20-29 years, which rose to 52.4% for people of aged ≥70 years [Table 2]. There was a sharp increase in the prevalence after the age of 50 years. With regard to gender, the prevalence of hypertension was 22.3% in males and 20.1% in females but this difference was found to be statistically insignificant (χ2 = 0.406; p = 0.542). The study found sedentary occupations such as managers, senior officials, professionals, technicians, shop sales workers, and housewives to have a higher prevalence of hypertension (25.5%) compared to people involved in nonsedentary occupations such as coolie workers, agriculture, fishery, craft, and trade-related workers (15.8%). This difference was found to be statistically significant (χ2 = 8.355; p = 0.004). Hypertension was found to be more common in the upper socioeconomic class compared to the lower socioeconomic class [Table 3]. The pattern of hypertension according to socioeconomic status was similar in both urban and rural areas. Increasing age, sedentary occupation, higher socioeconomic status, extra salt intake, family history of hypertension, reduced physical activity, tobacco smoking, smokeless tobacco consumption, alcohol consumption, BMI ≥25 kg/m 2 , and high WHR were found to be significant risk factors of hypertension [Table 4]. Family history of hypertension, BMI ≥25 kg/m 2 , and high WHR were found to be predominant risk factors of hypertension in the urban areas, whereas smokeless tobacco consumption was a predominant risk factor in the rural areas [Table 5]. World Health Report. Reducing Risks, Promoting Healthy Life. Geneva: WHO; 2005. Available from: . [Last accessed on 2014 Feb 18]. World Health Organization. World Health Statistics 2014. Geneva: WHO; 2014. Available from: . [Last accessed on 2014 Jul 23]. Kearney PM, Whelton M, Reynolds K, Munter P, Whelton PK, He J. Global burden of hypertension: Analysis of worldwide data. Lancet 2005;365:217-23. World Health Organization. Integrated Management of Cardiovascular Risk: Report of a WHO Meeting. Geneva: WHO; 2002. p. 9-12. Stamler J. Blood pressure and high blood pressure: Aspects of risk. Hypertension 1991;18(Suppl):I95-107. Report on Causes of Deaths in India 2001-2003. New Delhi: Office of the Registrar General of India, Govt. of India; 2010. p. 42-5. World Health Organization. Preventing Chronic Diseases: A Vital Investment. Geneva: WHO; 2005. p. 4-5. Gupta R. Rethinking diseases of affluence; coronary heart disease in developing countries. South Asian J Prev Cardiol 2006;10:65-78. Gajalakshmi V, Peto R. Verbal autopsy of 80,000 adult deaths in Tamil Nadu, south India. BMC Public Health 2004;4:47. World Health Organization. Health Expectancy is More Important than Life Expectancy - Message from the WHO Director General on The World Health Report 1998. Geneva: WHO; 1998. p. 5-6. World Health Organization. Prospects of Research on Non-Communicable Diseases in the African Sub-Region. Geneva: WHO; 2008. Available from: . [Last accessed on 2014 Feb 17]. Mohan V, Deepa M, Farooq S, Datta M, Deepa R. Prevalence, awareness and control of hypertension in Chennai--The Chennai Urban Rural Epidemiology Study. J Assoc Physicians India 2007;55:326-32. Gulati S, Sekhon AS, Goel NK, Sharma MK. A comparative study of risk factors in coronary artery disease in district Patiala. Indian J Prev Soc Med 2004;35:163-7. Todkar SS, Gujarathi VV, Tapare VS. Period prevalence and sociodemographic factors of hypertension in rural Maharashtra: A Cross-Sectional Study. Indian J Community Med 2009;34:83-7. Chobanian AV, Bakris GL, Black HR, Cushman WC, Green LA, Izzo JL Jr, et al. ; National Heart, Lung, and Blood Institute Joint National Committee on Prevention, Detection, Evaluation, and Treatment of High Blood Pressure; National High Blood Pressure Education Program Coordinating Committee. The Seventh Report of the Joint National Committee on prevention, detection, evaluation, and treatment of high blood pressure: The JNC 7 report. JAMA 2003; 289:2560-72. World Health Organization. Obesity and Overweight. Geneva: WHO; 2015. Available from: . [Last accessed on 2015 May 9]. National Programme for Prevention and Control of Cancer, Diabetes, Cardiovascular Disease and Stroke (NPCDCS). A Manual for Medical Officer. Government of India, WHO; 2008. Available from: . [Last accessed on 2015 Jul 27]. Rajasekar VD, Krishnagopal L, Mittal A, Singh Z, Purty AJ, Binu VS. Prevalence and risk factors for hypertension in a rural area of Tamil Nadu, South India. Indian J Med Specialties 2012;3:12-7. Prashant KR, Sunil GS. 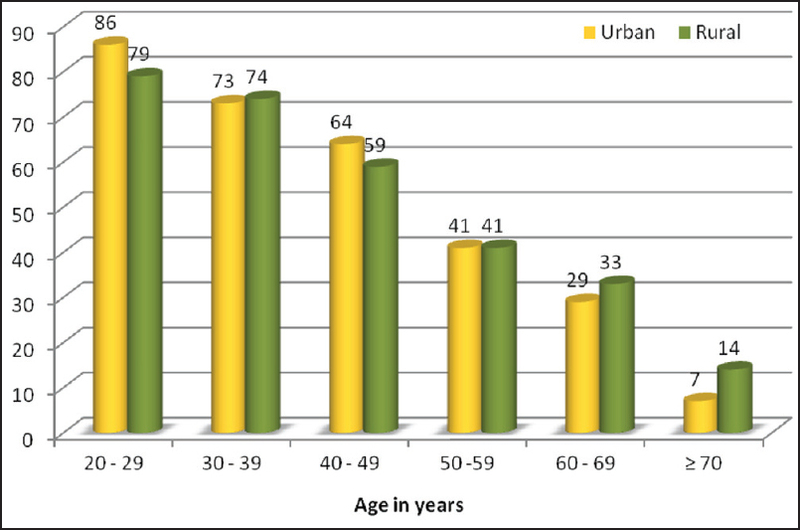 Prevalence of hypertension in a rural community of central India. Int J Biol Med Res 2011;2:950-3. Khadilkar HA, Ghattargi CH, Thite GH. Study on prevalence of hypertension and sociodemographic factors in a rural community of Maharashtra. South Asian J Prev Cardiol 2004;8:43-8. Gupta R, Gupta KD. Coronary heart disease in low socioeconomic status subjects in India: "An evolving epidemic". Indian Heart J 2009;61:358-67. Deng AY. Genetic basis of polygenic hypertension. Hum Mol Genet 2007;16:R195-202. Anand MP. Epidemiology and Current Concepts in Hypertension. 2 nd ed. Mumbai, India: ICP; 1995. p. 4-13. Fauci AS, Braunwald E, Kasper DL, Hauser SL, Longo DL, Jameson JL, et al. Harrison′s Principles of Internal Medicine. 17 th ed. New York, USA: McGraw Hill Medical; 2008. p. 1549-50. Stalmer R. Implications of the INTERSALT study. Hypertension 1991;17(Suppl):I16-20. Wofford MR, Hall JE. Pathophysiology and treatment of obesity hypertension. Curr Pharm Des 2004;10:3621-37. Mahmood SE, Srivastava A, Shrotriya VP, Shaifali I, Mishra P. Prevalence and epidemiological correlates of hypertension among labour population. Natl J Community Med 2011;2:43-8.